Gallup Custom Tinting / Route 66 Discount Tire has many products and services to offer our customers to suit a variety of auto needs. Our shop has tires for sale from Avenger, Conti, Courser, CrossContact, and ExtremeContact. 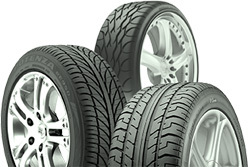 They are available in light truck tires, standard truck and car tires, extra wide, and extra tread. Driving without proper alignment costs you money. Not only does flawed alignment decrease gas mileage and tire life, but it also adds stress to your vehicle's steering equipment and structure. Ideally, your vehicle's wheels should run perpendicular to the ground and parallel to each other. Adjusting these wheel angles will bring your vehicle back into proper alignment. We will make the right adjustments so you experience a smoother ride, improved gas mileage, and safer driving. Gallup Custom Tinting / Route 66 Discount Tire offers battery replacement or electrical system repairs for the charging and starting systems. These parts include the alternator, starter motor, and wiring. Our ASE-certified technicians follow Motorist Assurance Program Uniform Inspection Guidelines for your vehicle's braking system to assure safe, smooth driving. 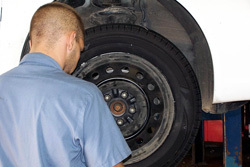 We inspect and repair disc brakes, drum brakes, parking brakes, and hydraulic systems. Get your brakes repaired if you hear squealing or grinding when using the breaks, your ABS light turns on, your car pulls to one side when braking, or your brakes feel spongy. With advanced control systems taking the place of simple engine components, common maintenance services such as tune-ups become less vital. 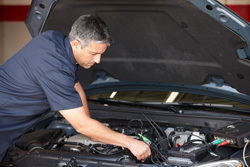 Your vehicle still requires regular services (such as spark plug and filter replacements). 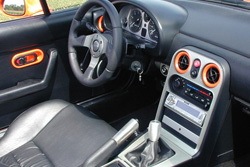 You will also need computerized analysis of your vehicle's control computer. Our factory-trained technicians provide these basic services. Bring in your vehicle, we'll check it out, and you can know if the "check engine" is a real problem, or just a sensor/computer issue. Customize your vehicle with cool accessories. Whether it's for your interior or exterior, we have something for everyone. When it comes to detailing, performance, or maintenance accessories, talk to our professionals and we will help you find what you need. Gallup Custom Tinting / Route 66 Discount Tire will install custom glass for your windshield and windows. 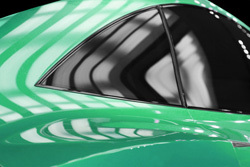 This can include ultra strong, shatter resistant glass, tinted glass, replacement glass for antique cars, and much more. Talk to us and see what we can do for your car. Want to make your vehicle stand out and perform better? Enhance your ride with custom wheels. The wheels you choose depend on your vehicle's use and driving conditions. For instance, you can increase the size of your wheels for off-road driving or add spinning rims for cruising around town. No matter your needs, talk to our professionals and we will give you custom wheel options. These include aluminum alloy or custom steel wheels. No matter what you drive, remember that your vehicle's axle must bear the weight of your vehicle (plus any cargo) along with the acceleration forces between you and the ground. When it comes to axle inspection, we are your source for professional, knowledgeable service. Bring your car to us and rest assured that the equipment that carries you and your family is safe and secure. Go out to a large space (such as a parking lot), and slowly drive in tight circles. If you hear a clicking or cracking noise, you have a worn joint, and it must be repaired immediately. The exhaust system controls noise and funnels exhaust fumes away from passengers. It also converts pollutants into less harmful byproducts, reduces engine noise, and directs exhaust gases to heat air and fuel before the fuel goes into the engine's cylinders. We service and repair the pipes, manifold, catalytic converter, muffler, resonator, and tail pipe. Have you recently been in a crash or a fender-bender? Believe us, we have seen it all and can honestly say we are front-end collision experts. Using the latest in collision repair technology, our service pros will correct any amount of damage your car has endured. From major structural problems to cosmetic flaws, we will erase any dent, ding, scratch, or chip. 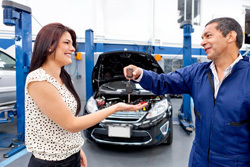 We will get you back on the road and restore your vehicle to its regular condition. Lifts, Lower, & Leveling Kits: We work with all types of lift kits including lifted spring suspension, shackle suspension, shackle reverse, and coil suspension. Leveling kits improve your vehicle's look as well as provide added safety. For a more attractive appearance, better handling, suspension, and tire wear, get your vehicle assessed today. Lowering kits enhance vehicle performance and our technicians will complete your lowering kit job properly. 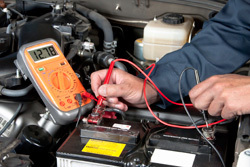 We know that a leak in your radiator can turn a messy situation into a major repair for your vehicle. 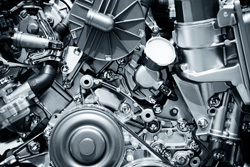 Your radiator is one of your vehicle's most vital components. The radiator displaces heat caused by your engine in order to keep the engine cool and running correctly. Our friendly and courteous auto care professionals will repair your radiator, when possible, and get you back on the road with confidence. We want to make sure your radiator will keep your engine at the optimal temperature so you can avoid a much more costly visit to our shop. Your car's suspension and steering system allows your wheels to move independently of the car, while keeping it "suspended" and stable. Any play or uncontrolled motion in these systems results in handling deterioration and accelerated tire wear. Also, your vehicle's alignment affects the condition of the suspension and steering systems. We repair control arms, ball joints, springs, shock absorbers, and struts. An improperly repaired tire may fail when driven at high speed causing loss of vehicle control. 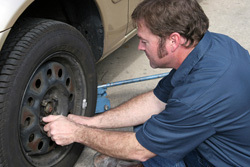 Flat or damaged tires need to be repaired by qualified personnel. Proper tire repair is critical and any puncture or injury to a tire will affect its performance. Call or email us to repair or replace your damaged, punctured or leaky tires. Save money with our tire retreading system. Simply put, we select and inspect worn tires and give them new treads. Besides the money you save, you help the environment by recycling your tires. For instance, some tires can be retreaded up to ten times. Before a tire can be retreaded, it must pass careful inspection to ensure the tire's casing can be reused. This rigorous inspection guarantees only the best used tires are retreaded. After inspection, we mechanically buffer the approved tires to the correct radius and diameter. Following the buffer, we attach the new tread to the tire through time, heat, pressure, and vulcanization. We then inspect the retreaded tires a second time, and finally, we trim and paint them for you. Every two years or 30,000 miles, you should get a tune up. 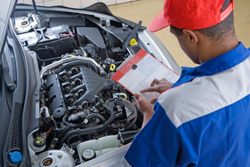 This includes fuel filter replacement, spark plugs and wire replacement, distributor cap and rotor replacement, ignition system and timing, valve and gasket adjustments, belts inspection, fluid top offs, oil change, air fulter replacement, and battery service. We can help restore your wheels to their factory condition or help you create a customized look to fit your style. Wheel refinishing is the art of re-engineering the look of your wheels. We perform all types of refinishing, from simple painting to polishing. Gallup Custom Tinting / Route 66 Discount Tire installed 3M window films on any car. Choose from a complete selection of films that vary in color, shade, construction, and warranty. Reduce glare, protect yourself from glass in an accident, prevent interior cracking and fading, keep UV rays off your skin, enhance privacy, and keep your car cooler in the summer. Without regular maintenance an air conditioner loses about 5% of its original efficiency per year. We service and repair compressors, condensers, receivers, orifice tubes, expansion valves, and evaporators.